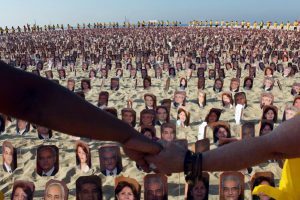 Governments and human rights organizations around the world have expressed strong concern at reports that seven Iranian Baha'i leaders have each received prison sentences of 20 years. 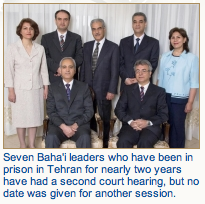 GENEVA — Reports that seven Iranian Baha’i leaders have each received prison sentences of 20 years have been met with condemnation from governments and human rights organizations around the world. Australia, Canada, France, Germany – and the President of the European Parliament – have all expressed strong statements of concern. They are calling for the prisoners to be released on bail, for an annulment of the judgment, and for Iran to demonstrate that the trial was fair and in accordance with international standards. 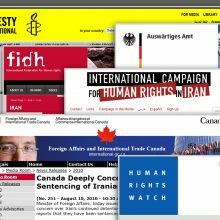 Canada’s Minister of Foreign Affairs, Lawrence Cannon, said that his country was “deeply disturbed” by the sentences that were “passed without either written judgments or due process.” He urged Iran to grant bail to the prisoners. “There are major doubts as to the compliance with the basic legal rights during the judicial proceedings,” he said. France expressed its “consternation” at the 20-year jail term. fair and transparent and are conducted in accordance with Iran’s international obligations,” said a spokesman for the Australian government’s Department of Foreign Affairs and Trade. “Iran has committed itself to international standards and I underline that this includes also the respect and protection of religious freedom,” he said. International human rights organizations have additionally joined the chorus of protest against the reported prison sentences. 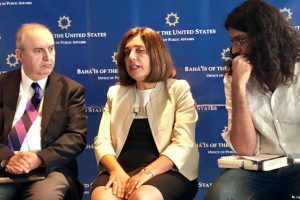 “They have been sentenced for being Baha’is, nothing else, and their incarceration thus expresses a policy of oppression of the Baha’i Faith and its members,” said Aaron Rhodes, spokesperson for the Campaign. “The seven were held for months without charge before being subjected to a parody of a trial. They must be immediately released,” said Hassiba Hadj Sahraoui, Amnesty’s Middle East and North Africa deputy director. “For more than two years now the Iranian authorities have utterly failed to provide the slightest shred of evidence indicating any basis for detaining these seven Baha’i leaders, let alone sentencing them to 20 years in prison,” said Joe Stork, deputy director of the Middle East division at Human Rights Watch. “The immediate and unconditional release of the seven Baha’i leaders would be a good start,” he said. Diane Ala’i, Baha’i representative to the United Nations in Geneva, said the Baha’i International Community deeply appreciates the committed support offered so far by governments and human rights organizations. 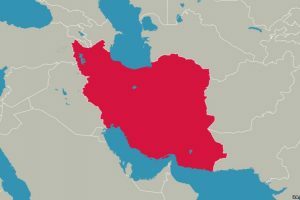 “These statements demonstrate that increasing numbers of people of all races and religions throughout the world want to see justice done in Iran – not just for the Baha’is but all of its citizens who face gross human rights violations,” said Ms. Ala’i. “For how much longer will the Iranian authorities remain oblivious to these upraised voices?” she said. Posted in Government Support, prison, tehran, Youth. The news item regarding the unjustifiable imprisonment of “Yaran” in Iran and slapping them each with a hefty 20 years prison sentence is an unprecedented event in the annals of modern Iranian history. This once again indicates the waywardness of the decision makers in today’s Iran who instead of busying themselves with the ills and development of the country and improving the overall quality of life of its citizens, have made themselves busy to hunt down “Innocent Iranian Baha’is” as whole, and this group of Yaran per se– whose only goal was to look after the affairs of the under-privileged Baha’i community of Iran, the largest religious minority group there. The decision makers think (in vain) that by accusing this innocent group of unimaginable crimes that they have never committed, nor they could have ever contemplated even in their wildest dreams, and then by their subsequent incarceration, they can kill their souls and spirits and those of the other Iranian Baha’is too. The Iranian regime might have confined many innocent Iranian Baha’is, these high flying eagles, in cages but they cannot and will never be able to make them forget how to fly! Regime thinks that they might have been able to extinguish the “Fire”, but they do not know that countless of “Fires” are still burning ever stronger, deep even under the heaviest and thickest ashes. These wayward representatives of the so-called justice system of the present-day Iran who in the first instance do not even know what justice is and what justice means, have made the greatest mistake of their life to believe that by arresting and imprisonment of a handful of the faithful members who used to form part of the leadership, the whole system will eventually collapse. They have forgotten that the followers and believers since the inception of this “Religion of God” have shed their blood by the thousands and their pure blood has made the Tree grow stronger and taller and this “Faith” only in a matter of 166 years from obscurity has come to prominence and has already spread to all over and every corner of the world….. How vain and uninformed of them to overlook and even worse, to disregard these historical “Facts”!!! This is indeed another exercise of the Iranian regime in futility and out of despair…..
As the stability of the world is dependant upon the two pillars of “Reward and Punishment”, hence with no doubt whatsoever the captives will have their eternal reward. Although I personally forgive the oppressors, because of their ignorance and wish that one day soon they come to realise the innocence of those whom they have falsely accused and apologise for it, however I do not know how the “All Mighty” will deal with them…..
And I leave you here to ponder upon…..